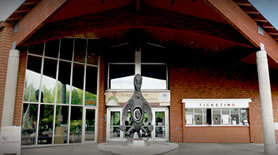 The Alaska Native Heritage Center is the premier cultural center in Alaska sharing the rich heritage of the state’s 11 major indigenous groups. You can experience Alaska Native culture first-hand through engaging storytelling, authentic Native song and dance, artist demonstrations, Native Games demonstrations and more. Workshops & classes, museum exhibitions, celebrations, special events, and films. While visiting the Alaska Native Heritage Center you can explore six authentic life-sized Native dwellings situated in a wooded area around beautiful Lake Tiulana and are introduced to the traditional life ways of the Athabascan, Inupiaq/St Lawrence Island Yupik, Yup’ik/Cup’ik, Aleut, Alutiiq, and the Eyak, Tlingit, Haida and Tsimshian peoples. The Alaska Native Heritage Center is an amazing interactive cultural experience. More than a museum, the Center provides an opportunity to explore the indigenous cultures of Alaska firsthand – cultures that continue to adapt to modern society, yet still maintain a vibrant identity for the Native peoples of Alaska. Get an in-depth experience of their living cultures at ANHC through storytelling, artist demonstrations, Native dance performances, Native games demonstrations, movies and more. Choose to watch or take it to the next level and participate. Opportunities to create your own art, learn a Yu’pik dance or throw a spear await the more adventuresome visitor. Outside of the main facility, a meandering wooded path surrounding a picturesque lake guides visitors through six life-sized ancient dwellings representing the 11 culture groups of Alaska. Cultural representatives at each site share how Alaska Native peoples thrived in a harsh and unforgiving climate, what their daily lives were like and how their cultures live today in a changing world. Also, see art classes in progress where artists teach interns how to make regalia, drums and more. Open Daily – 9:00 a.m. to 5:00 p.m. I am a counselor at Job Corps in Palmer looking for a story teller to come share stories with our students. 907-861-0453.